If you are lonely, or feel empty, or aren’t sure who you really are or what you really want in life, career, relationships, and if you are often feeling angry and/or having high conflict in relationships this Ebook will be of tremendous help to you in better understanding that loneliness is a normal part of life. Loneliness has a purpose. 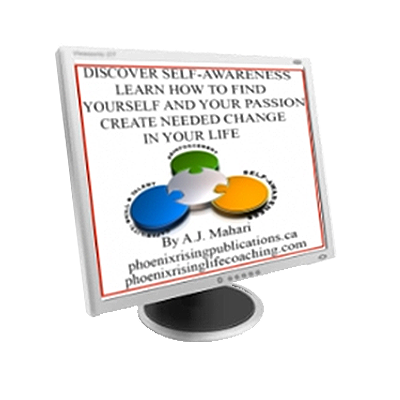 If you are lonely, or feel empty, or aren’t sure who you really are or what you really want in life, career, relationships, and if you are often feeling angry and/or having high conflict in relationships this Ebook will be of tremendous help to you in better understanding that loneliness is a normal part of life. Loneliness has a purpose. Loneliness seeks to teach you. Learn to open to its lessons and you can transform your loneliness into healthier styles of relating to self and others and you can also learn how to be alone in solitude and satisfaction instead of pain. If you are lonely you do not need to feel like a victim anymore. This Ebook will empower you to go from feeling like a victim and/or an excessive focus on your past to being a survivor learning to thrive in the here and now and to find your way to contentedness that can transform everything negatively experienced as loneliness. This ebook includes a section on abandonment and the core wound of abandonment in Borderline Personality Disorder (how it effects the non-borderline in relation to the borderline), and its impact and effect upon the loneliness experienced by those who were sexually abused. 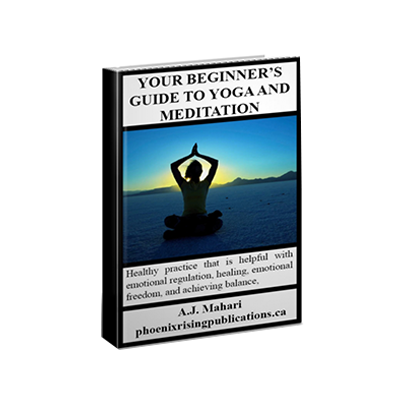 This ebook is an examination of loneliness – including types of loneliness, causes of loneliness, Holidays and Loneliness, the lessons of loneliness, what to do about the pain of loneliness, how to cope with it. Along with the challenges of loneliness, what they are and why they are, the lessons of loneliness – what does loneliness really mean in our lives? 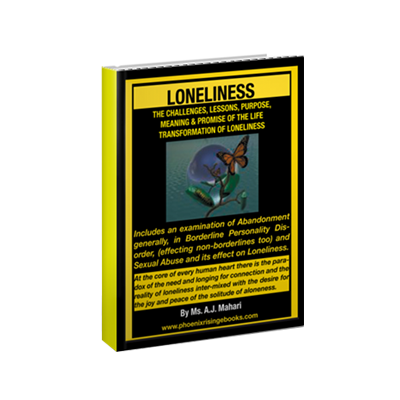 Also explored and examined is the purpose and meaning of loneliness and the promise it offers of life transformation.This ebook, available now, is 238 pages – 13 chapters all about Loneliness and the life affirming and transforming opportunities it presents us with through the pain and struggles we encounter with it. Chapter 2: Types, Symptoms and Effects of Loneliness –The 3 Main Categories of Loneliness are examined along with 10 central Symptoms of Loneliness and the 7 Major Effects of Loneliness. The value of the challenges of Loneliness. Loneliness is such a teacher of important lessons, if you’ll let it be. seem to make feelings of loneliness worse? What can we do to cope with loneliness during holiday seasons? PART TWO: ABANDONMENT WOUNDS — in life generally, and in Borderline Personality Disorder, (BPD) effecting non-borderlines too, and Sexual Abuse. Chapter 4: Unresolved Abandonment and Chronic Loneliness — Even for those without formal mental illness or who were not abused in childhood can have abandonment wounds that fuel chronic loneliness. Chapter 5: Abandonment Wounds and Loneliness in Borderline Personality Disorder — Abandonment wounds and consistent abandonment fears of those diagnosed with BPD create and perpetuate chronic and intolerable loneliness. Plus the loneliness of the non-BP (ex) partner is explored. You do not have to have a personality disorder or mental illness to have unresolved abandonment issues that are a central part of your loneliness. Chapter 6: Abandonment Wounds in Loneliness from Sexual Abuse — For those who have been sexually abused the result is abandonment wounds similar to those in BPD that enliven many of the root causes of loneliness defined in my continuum of loneliness. This continuum of loneliness applies to all of us, not just to people who have been sexually abused. Chapter 7: The Necessity of Loneliness — Loneliness is necessary because it is the pathway to the soul and the authentic self of each one of us. An examination of how and why Loneliness and its pain are necessary teachers. What is the point of the pain? An examination of the hope of the pain of Loneliness. Loneliness can be a transformative teacher.